The supporters of the Lt Governor slammed the Congress party in the after seeing the posters. Puducherry: Puducherry Pradesh Congress committee raked up a controversy by releasing a series of posters against Lt Governor Kiran Bedi including one which portrayed Ms Bedi as Adolf Hitler. The never-ending confrontation between the elected government and Lt Governor Kiran Bedi reached new flashpoint with the Lt Governor tweeting the poster, portraying her as Adolf Hitler, which was put up at Thavlakuppam junction on Cuddalore road here as part of an agitation organised by the party to protest against the nomination of three BJP-affiliated persons as MLAs, with a folded hands' emoticon. Ms Bedi also tweeted another poster allegedly made by the Congress unit portraying her as Goddess Kali, holding the decapitated head of some politicians, including that of Chief Minister V. Narayanasamy. In another, a poster a cartoon was shown in which Lt Governor being chased away. The posters evoked a strong response from Ms Bedi and her supporters. Responding to this the Lt Governor had reportedly said the posters are seriously 'objectionable'. 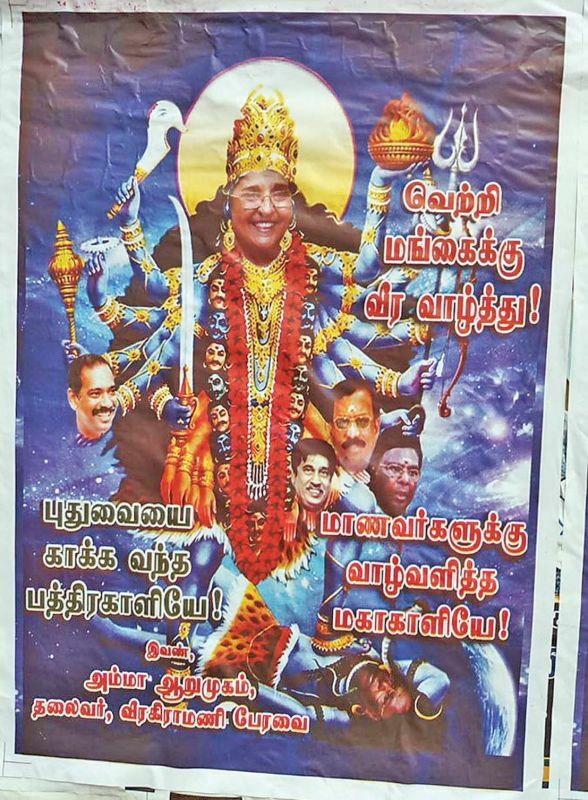 One of the posters which portrays Lt Governor Kiran Bedi as Goddess Kali released by Puducherry Pradesh Congress committee in Puducherry on Friday. "You don't have right to spoil the image of an Office. 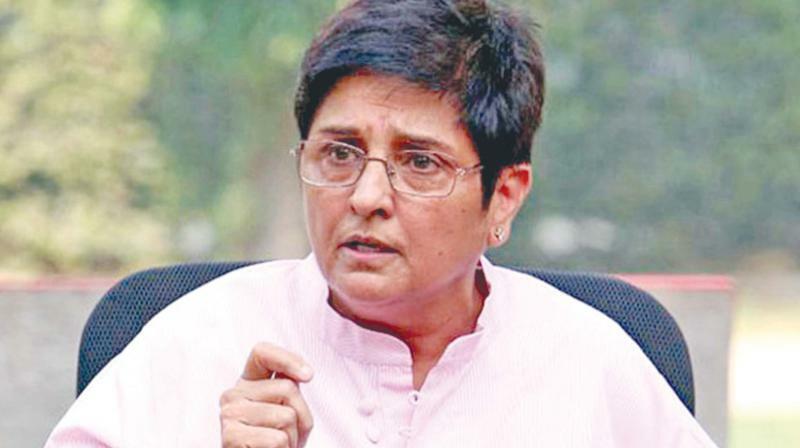 It is seriously objectionable," Bedi told ANI. "I see this as a chapter in the book which has to be written. Sooner or later", she further tweeted. The supporters of the Lt Governor slammed the Congress party in the after seeing the posters. Chief Minister V. Narayanasamy also expressed his disapproval over the derogatory posters. "I had already called the party leaders and asked them to refrain from criticising Lt Governor", said the Chief Minister while talking to reporters here. At the same time, legislator K. Lakshminarayanan said that the Lt Governor has adopted an arrogant style of functioning and so people are reacting hard.
" The Lt Governor's way of functioning is arrogant and thus the people are reacting like this. It is all about the attitude. Most importantly, no one is beyond criticism", he told DC. The nomination of Puducherry BJP unit president A Saminathan and treasurer K G Shankar and BJP sympathiser Selvaganapathy as members of the assembly on July 4 by the Centre, allegedly follow the directions from the Lt Governor opened up a new chapter in the ongoing tussle between the elected government and the Lt Governor. Puducherry Lt Governor Kiran Bedi ceased the functioning of seven legislators in the post of chairmen of statutory bodies and government undertakings from the date of completion of their tenure of one year, even though the government had recommended their continuance in the post. The order was issued as the government failed to send the mid-term performance appraisal and the year-end review report of the chairpersons to the Lt Governor. Rider clauses pertaining to performance were added in the appointment of chairmen to public sector undertakings this year. "The performance of the statutory body under the leadership of the newly appointed chairman shall be reviewed before considering his continuance. A midterm measurable performance appraisal of the institution shall also be carried out engaging professionals in the field after six months", a notification issued by the Lt Governor during the time of appointment said. Though the Chief Minister recommended that the tenure of the present chairpersons should be renewed as their performance was satisfactory, the Governor returned the files asking for review reports.
" A meeting of the council held on July 14 recommended that the MLAs continue in the post until further orders without any appraisal reports required under their terms of appointment." The secretaries of the concerned departments will function as the chairpersons till the receipt of the pending decision of the Government of India, the Lt Governor said. Representations were also received from political parties and civil society organisations against the continuance of the legislators in the post, she added.